Many of those who were killed in the atomic bombing died as they called for water, water... 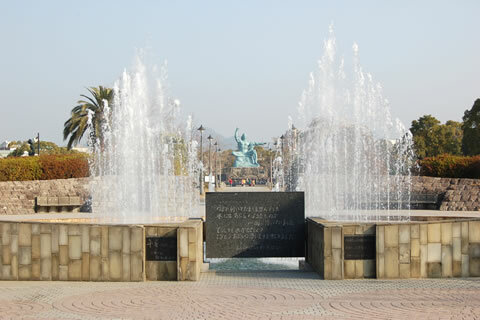 This fountain, which was constructed with contributions from around the country, is dedicated to their memory and represents aspirations for lasting world peace. The inscribed passage is taken from the diary of a young woman who experienced the bombing. She wrote, "I was so terribly thirsty..." The constantly changing pattern of the falling water represents the wing-beats of a dove of peace, and also symbolizes Nagasaki harbor, known as the harbor of the crane.